The plastic bag is dead, long live the home-made grocery bag! Not sure how the rest of the world views plastic carrier bags, but in the UK they're definitely an endangered species. But enter the home-made and decidedly more chic grocery bag (shopping bag, tote...call it what you will). My bag started life from as a collection of fabric donated to me by a lovely friend at work. I used the 3 pieces in the bottom right corner for this project. I played around with numbers and sketches, deciding on a 3 tone bag dictated by which pieces of fabric were bigger, The fabric was a heavyweight cotton so I didn't need to line the bag. I squared the bottom of the bag to make it more stable when packing, and reinforced where the handles join the bag with a box and cross stitching arrangement. The fabric was pre-washed to avoid shrinkage as I want to be able to wash my grocery bags in the future. I loved my bag so much I made a couple more. Oooh get me with my matching shopping bags! Soooo much more stylish when one is perusing the aisles of the Marks and Spencers Food Hall, and equally at home buying spuds from t'market! Lovely bags, I've been using my own bags for a while now. However I will admit to using an Aldi Bag in Tesco LOL! Very nice, much more stylish than plastic bags! I'm also guilty of whipping out bags from different supermarkets to the one I'm in - but I think that's OK.
How cool would it be to do my weekly shop and instead of whipping out 8 tatty supermarket jute bags whip out my own creations ?! Brill! I'm off to dig about in my fabric stash - it's been gathering dust of late ! These look great! 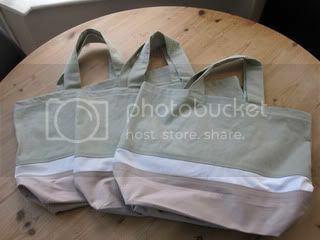 I have a little bit of a thing for canvas shopping bags and seem to be accumlating a collection! 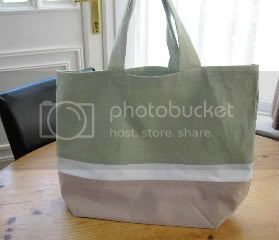 Great bags - and so much nicer than a plastic bag! By the way found this post through Love New Blogs. Paint (for plastics) is probably your best way of getting it done right.